Experience the secrets of our Loto spa, relax recharge, and heal your body. The Spa at The Royal Corin Thermal Water & Spa Resort is one of the most serene and indulgent spas in Costa Rica. The quality of treatments and level of service are world class and you'll love our peaceful, down to earth personnel. We believe in relaxation; so you won't be rushed, you'll be pampered and reinvigorated every time you visit. Located on the edge of the Volcano Arenal, the modern, warm, and exclusively decorated spa offers a unique experience in an unrivalled natural environment with private outdoor Thermal water Jacuzzis and Tropical Spa garden. 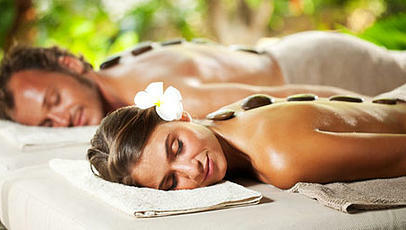 We offer a selection of holistic treatments including massages, facials, hand and foot treatments, along with body care. The Spa team is committed to your assure that your treatment meets your specific needs. The Royal Corin Thermal Water & Spa Resort Loto Spa has various treatment rooms, beautiful showers and changing rooms, sauna and private natural Thermal water jacuzzis surrounded by the gorgeous native flora. For a complete wellness experience, finish off your spa treatment with relaxation time in the adjacent sauna, thermal water hot tub, natural thermal water garden steam room, or healing thermal water swimming pool. Let them decide how to spend their time at The Royal Corin Thermal Water & Spa Resort with a specified dollar value gift certificate.